The next vegetable on our ‘From the Ground Up’ feature is the purple sweet potato! A beautiful deep coloured vegetable with a juicy flesh. 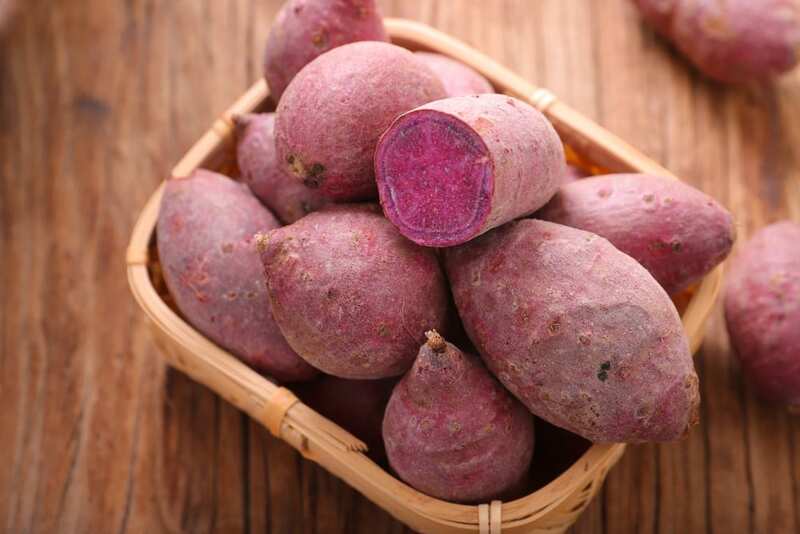 The anthocyanin’s in the potato that give it it’s impressive appearance also carry beneficial health effects as they protect the liver, whilst also lowering blood pressure. Not only this but they’re packed with potassium, B6, fibre and antioxidants, making purple sweet potatoes truly magnificent! Purple sweet potatoes have a rich flavour which some describe as winey. They are denser and drier than regular sweet potatoes. How do you store, prepare and cook it? You should never keep any sweet potato in the refrigerator, it should always be stored in a cool, dry place. If you want to eat the potato raw as a snack with some tasty dips, then peel it and cut into chunks or slice. When cooking, purple sweet potatoes will take longer than their orange counterparts; you will need to cook them for around 90 minutes to 2 hours at 180C/Gas Mark 4. As with all potatoes, this kind can be boiled, steamed, baked, mashed, fried or blended into soup. There really are no limitations on what they can do. Cooking this delicious vegetable only enhances its rich colour meaning that any dish will look super impressive! Purple sweet potatoes are available all year round! As we said above, purple sweet potatoes can be enjoyed in any of the ways that a usual potato would. Because of it’s amazing colour, we recommend mashing them or blending them for a soup. We also LOVE purple sweet potatoes when they’re used as fries, which is why if you click here you can find a full recipe to delicious loaded veg fries. Add purple sweet potatoes to your basket today!